We’re excited to announce a brand new event type coming to STAR TREK TIMELINES - Skirmishes! In addition to our current event types, the Skirmish event type will offer Captains a new way to play the game: successive ship battles. 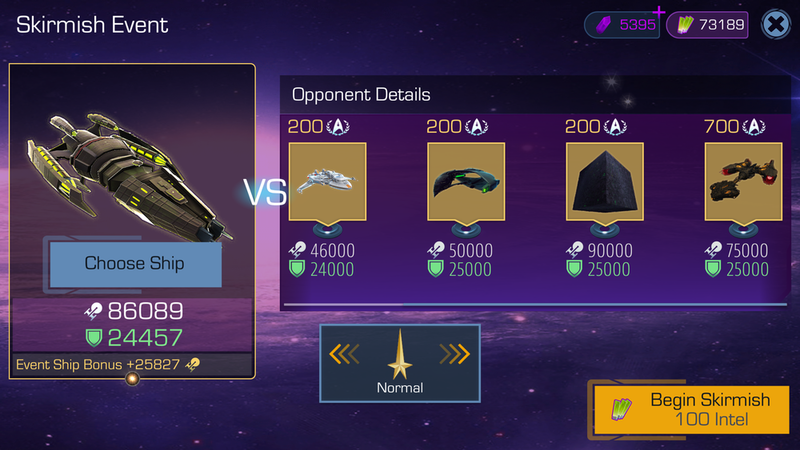 During a Skirmish event, Captains will be able to spend a new currency called Intel to compete in ship battles against different enemy vessels. The more battles you win in a Skirmish, the more Victory Points (VP) you’ll earn for the event. From battle to battle in a Skirmish, your ship’s shields will replenish, but your hull's damage will carry over. 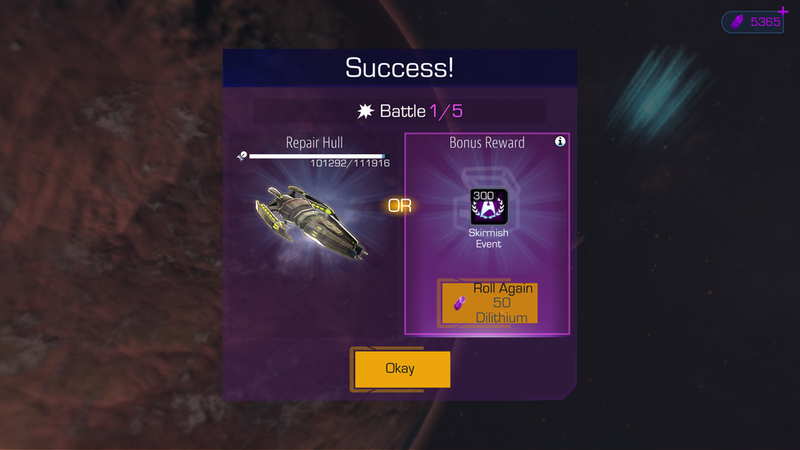 However, at the end of each successful battle, you will have the option to repair your ship’s hull or receive currency rewards such as Chronitons, Credits, Honor, Intel or Victory Points (more rewards can be gained by rolling again with Dilithium). If you can survive five battles in a row, you will receive the maximum amount of VP possible from a single Skirmish. Like other events, Skirmish events will have two phases. When phase 1 ends and phase 2 begins Intel costs will be reset. As we monitor performance during our first few Skirmish events, the amount of battles available per Skirmish and per phase may be adjusted. Similar to Expedition events, you will need a special currency to participate. For Skirmish events, this currency is called Intel. Intel will accrue over the course of the event, but you can also gain Intel by completing PvE ship battles in Episode and Distress Call missions once the event begins. The Chroniton cost of those missions will reward you with 10 times that amount of Intel (Intel rewards are not affected by active supply kits). Note that Intel does not rollover to future Skirmish events, so there’s no point in saving up for the future. Now that you have a better picture of what a Skirmish event looks like, let’s get into the details. Each Skirmish you choose to begin will have a certain difficulty level -- Normal, Elite, or Epic. Normal Skirmishes will allow you to only use and fight against 1-2 star ships, Elite Skirmishes will allow for 3-4 star ships, and Epic Skirmishes will allow for you to command and fight 4-5 star ships. Some of the ships you fight may be higher-star rating ships (like the U.S.S. Discovery), but their stats will be balanced for the difficulty chosen. Different featured ships will give hull bonuses during each event, so choose your ship wisely. In addition, various crew members can give bonuses to VP from won battles, to round-to-round hull healing, and to bonus loot if they have one of the bonus crew traits and/or if they are featured event crew. Please note this is a change from the original way in which Skirmish events were designed. After fixing a bug with these events, your feedback helped us to make the decision to change how these events operate. As we continue to test and evaluate Skirmishes, we will assess whether additional modifications are needed. (Bolded text updated on 9/13/18). Once you have selected your ship and difficulty and pay Intel to begin a Skirmish, you are locked into that ship and ready to begin. From round to round, you will command the same ship but you will have the option to swap crew. The bonus traits for crew will also change when a new phase begins. Before each Skirmish event, there will be a standard event pack which will contain featured crew. Moreover, there will be a new event Ship pack that includes featured ship schematics that can compete in the Normal, Elite, and Epic difficulty Skirmishes. These featured ships will receive hull bonuses throughout the event. 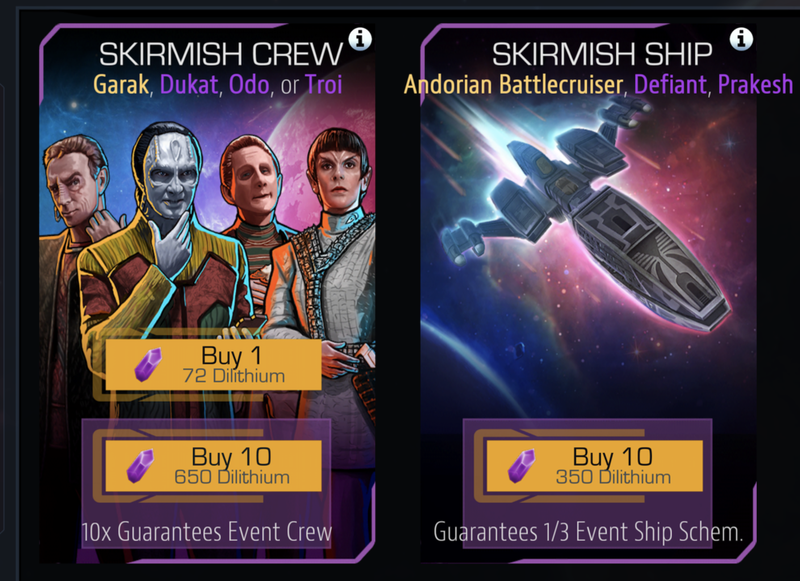 As you experience your first Skirmish event on May 31st as a part of our Augment and DS9-themed Mega-Event, “Superior Ambition,” send us your feedback under the Make It So section of our forums. We wish you the best of luck during the first Skirmish event, Captains!